There are now more than 400 research papers, as well as animal and human studies, showing that Molecular Hydrogen can be a beneficial nutrient in nearly every facet of human physiology, especially at the cellular level. 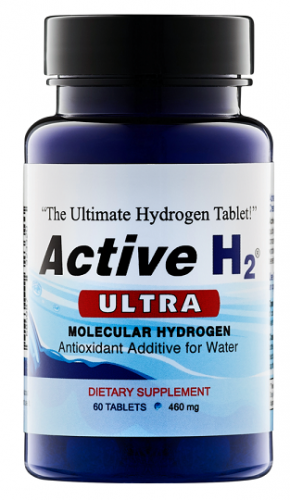 Active H2 Ultra tablets are the latest formulation of the original Active H2; a groundbreaking new supplement for adding the benefits of high-dose Molecular Hydrogen to pure drinking water. As the tablet reacts, millions of tiny hydrogen bubbles infuse and saturate the water. An additional benefit is that Active H2 Ultra generates an electron-rich potential (-ORP) in the water (you can measure it!). This rare property is uniquely found in fresh, raw living foods and juices, mothers milk and many of the world’s healing waters. Active H2 Ultra tablets conveniently provide a high dose of the key active ingredient, Molecular Hydrogen, making it superior to silica hydride and chemical hydride formulas, magnesium hydrogen sticks, alkaline ionizers (electrolysis) and medical hydrogen gas. The natural and proven Active H2 Ultra formula consists of a proprietary blend of pure magnesium, malic acid, fumaric acid and mannitol that act synergistically to generate Molecular Hydrogen and electron-rich potential (-ORP). Magnesium – As one of the most vital dietary minerals, it is a required mineral co-factor in more than 300 enzymes used in the human body. A government study confirms that 68% of Americans are deficient. Mannitol – Helps increase the activity of the enzyme catalase that protects cells from free-radical oxidative damage. Malic and Fumaric Acid – These natural molecules are also produced within the mitochondria (the cell’s batteries). Malic acid supports the body’s energy reserves while improving mental clarity and reversing muscle fatigue. Fumaric acid aids in ATP energy production, detoxification and anti-oxidation. Instantaneously converts toxic oxygen radicals to water. Assists in maintaining homeostatic levels of our body's antioxidants (e.g. glutathione). 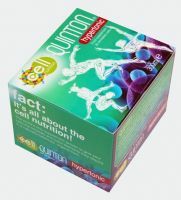 Assists in cell signaling, cell metabolism, and gene expression. Contains magnesium. A necessary co-factor for optimal health. Extremely SAFE. There are NO toxic by-products from the conversion of radicals to water. Water tastes smooth and light. NB: Active H2 Ultra delivers significantly more H2 than the previous Active H2 hence it is more expensive. The other difference is that you can prepare it in a glass of water and drink quickly - within 5-10 mins of the reaction stopping, or if using a bottle of water, let the reaction complete first before putting the lid on. If you drop the tablet in and immediately screw on the lid as before it will stop the reaction. Once reacted and sealed the H2 remains much more stable in the water for longer.